Give your roasts and veggies a earthy flavour - try smoking with hay! Tightwad first saw this on Pitchin' In... with awesome Chef Lynn Crawford cooking up lamb as her feature ingredient. Intrigued? Put some hay in a big casserole dish, cover with foil and put what you what to roast, and cover with a lid to get it on a high heat for about 5 to 10 minutes - this works in a bbq as well. 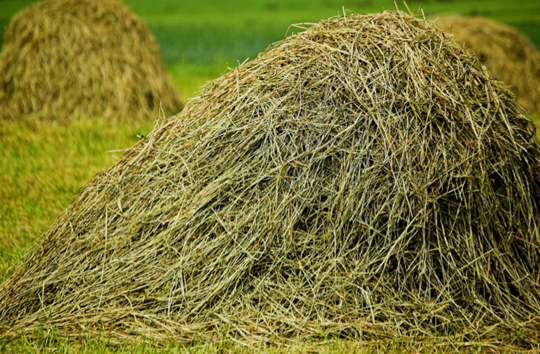 Once the hay is hot, turn down the heat and leave the food on until cooked. Rumour has it you will taste sun-scorched meadows. Here are some pointers: if you don't want a stained dish, line with foil first. Once you have turned off the heat, let it sit and cool for 20 minutes so your kitchen isn't filled with smoke! Try smoking garlic and potatoes. Yum!